Dawn breaks over the East Carolina sky as the intrepid recovery crew makes its way to the remains of Blackbeard’s flagship Queen Anne’s Revenge. This crew is limited in number but diverse in skill set, including marine archaeologists, conservators, divers and ship’s crew. Today they will recover 56 concretions and 19 buckets of dredge spoil. There are many tasks required of this group; one of these is the sometimes tedious but often rewarding task of dredge spoil processing. A dredge is used to collect the sediment around the concretions, and it is in this manner that many small objects are recovered. On this particular day, there are two crews of 3 people each assigned to dredge spoil at different times. The systematic recovery of the wreck is performed in 5-foot by 5-foot sections called archaeological unit squares or simply “units.” Dredge spoil from each unit is recovered and labelled separately. The first of two button faces was found in Unit 117. The button face is only 0.63 inches in diameter and weighs less than 2 grams – smaller than a dime, and the weight of a common tack. Only about 10 feet away in Unit 119, an almost identical button face was found. Pretty amazing when you think these objects are so light, subject to tides and hurricanes, yet so close as to be found on the same day. When properly assembled, they are each part of a 2-piece constructed button. The buttons are slightly domed with a decorative pattern consisting of 8 bevel-cut facets on the face, and a concave underside. The faces have been elementally examined using two methods. Manning a state-run lab located on the Eastern Carolina University campus, staff conservators often work with ECU personnel. This allowed for the use of the ECU scanning electron microscope for the initial examination. The buttons were later examined using X-Ray Fluorescence. The results from these examinations revealed not only copper, but over 50% tin on the surface. It is possible these copper buttons were tinned to give them a silver or grey appearance – copper masquerading as silver perhaps? The ship’s artifacts tell us a lot about the time period from apparel to weaponry -- and with continuing investigation, who knows what else will be uncovered? -Hume, Ivor Noel. A Guide to Artifacts of Colonial America. Philadelphia: University of Pennsylvania Press, 1969. 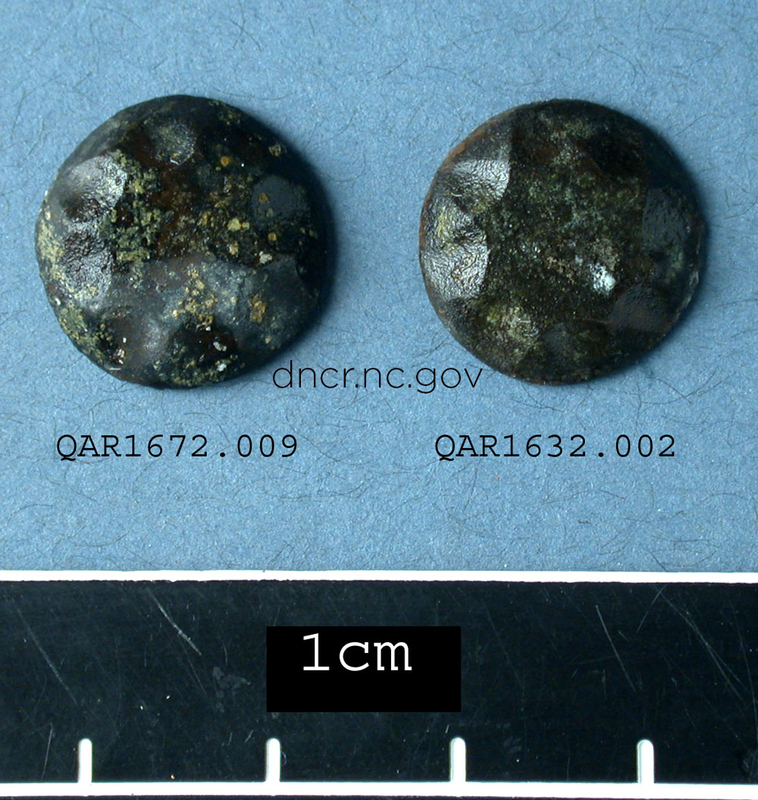 -Two copper alloy buttons from the QAR site. Image by NC Department of Natural and Cultural Resources. -A section of the site map showing the recovery locations of two similar buttons from QAR. Image by NC Department of Natural and Cultural Resources. 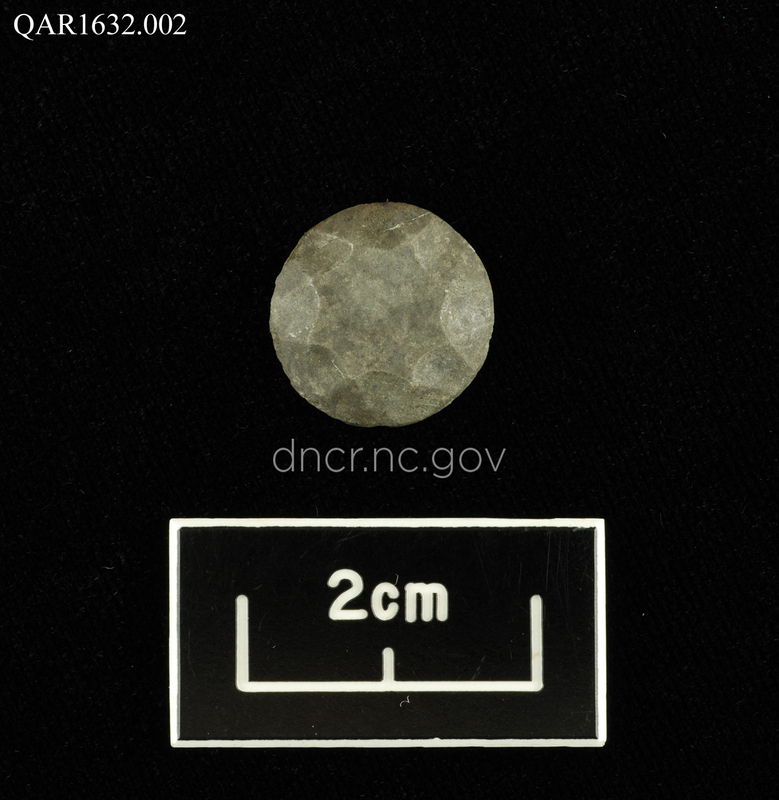 -A copper alloy button from the QAR site after conservation. Image by NC Department of Natural and Cultural Resources.